Everyone likes a story with a moral, something that teaches us a lesson. Look at how Aesop’s Fables, like The Hare and The Tortoise, have stood the test of time and crossed cultural barriers. I want to tell you another story that has stayed with me and, although I’m not exactly sure what the real moral of is, I know there is one. When I lived in Zimbabwe in 1992 I was invited to visit a witchdoctor. It was a chance to experience a unique part of traditional African culture, but what I expected to be a mere tourist trip, held a few valuable lessons for me. The funny thing is that I was sent to Zimbabwe to be a teacher but during my year there I learned much more important stuff than the english and maths I taught my pupils. Important lessons can come from unexpected places. It’ll take about four minutes to read but I think you’ll enjoy it. Oh, and the friend who took me to visit the witchdoctor really was called Pleasure. It’s all true. Please let me know what you think the moral is. Pleasure smiled, one arm extended formally. His vivid white boiler suit and lab coat stood out against the bare red dirt around us, the clothes as clean, crisp and unusual, in rural Zimbabwe, as fresh snow. As we shook hands I glanced down at my old dress, smoothing it flat against my tummy. It wasn’t easy being a white woman here, the only mzungu for miles around, but I tried to fit in. In a nod to local culture my dress modestly covered my upper legs and arms, and it was doubtful anyone would notice the stain on the skirt. Still, I knew that none of the other female teachers would wear it. They dressed in carefully in shiny dresses with elaborately braided hair showed my up as the scruffy London student I’d been only a few months earlier. Pleasure had already visited the clinic 60 kilometers away to see the ‘modern’ doctors, but he was still feeling ill and now seeking a traditional remedy. Knowing that foreigners liked to experience tribal customs, Pleasure had thoughtfully invited me to visit the nyanga, or witch doctor, with him. Now Pleasure’s slight figure marched across the fields, back straight, arms swinging and head set firmly towards the horizon, while I stumbled behind, eyes trained to the ground. From time to time he waited for me to catch up, but as soon as I drew close and slowed to take in the scenery, he sped off again, apparently indifferent to the fiery sun, rough terrain and my aching lungs. Eventually we arrived and were ushered into a tiny thatched hut where the dread-locked nyanga awaited us, wearing a smart shirt, a pink scarf, a blue blanket and a huge smile. After cheerfully shooing away two curious children, he sat down on the dirt floor, back and legs straight, ankles crossed tidily. The smell of smoke filled the air, and dust clung to an array of bottles and jars clustered behind him. Pleasure and I sat down too and, as our eyes grew used to the flickering darkness, the consultation began. The nyanga and Pleasure talked to each other in shona with low, urgent voices, while I watched and listened, but understood nothing. The nyanga carefully unwrapped a paper parcel and took out some small bones. He cupped them in his hands, shook them and dropped them deliberately, then mumbled softly to himself and shook his head. His magic rituals and charismatic energy transfixed us, and Pleasure and I watched carefully, trying to read the secret messages hidden in the pattern of the bones and the nyanga‘s body language. I was looking forward to seeing which of the assorted containers held the cure for Pleasure’s ailment. Our meeting ended abruptly, the bright sunlight breaking its spell as the nyanga waved goodbye. Pleasure maintained his usual silence all the way home and walked me right back to my door. I thanked him for taking me, but was still curious about what treatment the nyanga had prescribed him. I waited for him to confirm my suspicion that we’d walked 30 kilometers only to be hoodwinked by a charlatan. I hadn’t seen any money change hands, but I guessed Pleasure had traded something for an hour of hocus-pocus and a superstitious spell. Thanks for reading, please add your comments below and don’t forget to subscribe by email now or to the RSS Feed, if you haven’t already, so you don’t miss out. If you like this article, please Tweet it or tell a friend. My clever computer boffin has added a little tool to make it easier for you to email it to a friend or add it to your favorite social media website. I hear that if you Digg it, or bookmark it on Delicious or Stumbleupon, that will get more readers here. Many thanks for your help, I appreciate it. Mmm I can’t think of a moral….maybe the witch doctor did really know his stuff and knows when orthodox and non-orthodox methods should and should not be used! It looks like it, but that certainly wasn’t what I expected! Great post. I really appreciate and agree with your words. Thanks for sharing such beautiful thoughts. Fantastic ! Peter is the man, but we know that already. I’m someone who’s been on lots of pills and has actually visited a witch doctor, all to cure my Tourette’s Syndrome. That witch doctor (in rural Nevada, no less!) eventually went to prison. The pills never started working. What a great story you’ve told here. 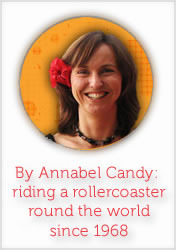 Thanks for featuring such a cool guest, Annabel. This is great little vignette, Annabel. I think the moral is probably different for everyone, which is what makes it so delish. Well, done Ms. Accomplished Writer! First off, your friend had something confirmed so he could stop worrying and get better. Secondly, the witch doctor had no fear of modern medicine being “right”. He was willing to admit that he had nothing more to add to the healing process. Of course, by his agreement, he added something. Go home, rest and relax. You’re doing the right thing. Agreement is priceless! This is a great story! I think the moral is that the witchdoctor stays in business because he’s smart and has great people skills. :) FYI, I’ve featured this post on my blog today. Love this! The moral? I don’t know, but I agree with Jennifer that the witch doctor was smart and had good people skills. I’ve lived in Africa for years, and although I’ve stayed away from witch doctors myself, I’ve heard enough stories, good and bad, to not make sweeping statements about them! I experienced the same in Tanzania. Still, there are lots to learn from African in this century.